The region of Savoie in France, on the Swiss border, was only known to me as far as Albertville, where the 1992 Winter Olympics were held. Luckily, among the many things that wine can do is get you to bust out a map (or Google) and find out where the heck this bottle comes from. Abymes is the opposite of abysmal. Actually, my memory is starting to jar, as I recall a fantastic rose from the region. It made my afternoon perfect. 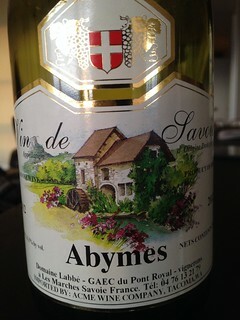 Anyway, the 2012 Domaine Labbe Abymes Vin de Savoie is made from an unfamiliar grape: Jacquère. I found it surprisingly rich, especially for a wine with an average retail price of $12. 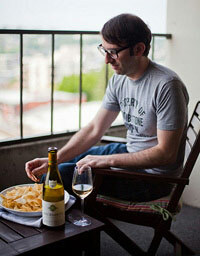 Sometimes it’s nice to take a break from the wines with searing acidity and have something a little richer. Yet don’t give me something heavy and dull, like a tarnished old Olympic medal on the neck of an athlete who never translated a fleeting moment of success into a lifetime of triumph and acclaim. And when I call this wine worthy of a “Gold Medal” I’m not talking about something stamped on a wine label touting the result of a state/county/ward/borough/town fair. Nope, this is my world, my blog, and my medal system. Put this fantastic bargain on the podium!! !